iOS 7 is now on 85% of devices connected to the App Store, according to new numbers posted on Apple's App Store developer support page. The numbers come five months after the operating system's original release, and just two weeks after the release iOS 7.1, which was the first major update to iOS 7 with added visual tweaks, CarPlay support, and Touch ID enhancements. The increasing adoption rate of iOS 7 has also led to a drop in iOS 6 usage, with the older operating system now installed on just 12 percent of devices. Three percent of devices also continue to use even older versions of iOS. 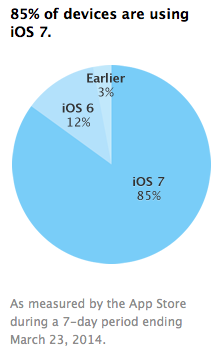 In early December, iOS 7 usage was at 74 percent, jumping to 78 percent later in December and then to 80 percent in late January. Apple's data, which comes directly from the App Store, represents the most definite iOS 7 adoption information for developers. then there's poor old KitKat. If only apple didn't botch iOS 7.1 by snubbing battery life. Staying on iOS 7.0.6 for the foreseeable future. Still much better adoption rates than Android will ever see. That chart doesn't scream "botched" to me, I don't know where you are getting that from. For 3 out of the 7 devices, the battery life is the same or even better, and even the worst one is only off 9%, which is probably still far longer than your average non-Apple tablet in terms of size/weight vs. battery life. On average the 7.1 vs. 7.0 battery life only looks a few % difference either way, that's hardly a disaster. It's not surprising considering any device capable of upgrading to ios7 has been warned of a major security flaw for not upgrading. How are you coming to the conclusion that the SSL security flaw is responsible for iOS's high adoption rate? As noted in the article, iOS7 adoption was already 80% in late January, which was before the security flaw surfaced. I never had a problem with iOS 7 performance or battery life. But I am getting increasingly annoyed at the overall "flatness" of the UI. One of my apps got "updated" to iOS 7 today and in the release notes they say "NEW! New Icon for iOS 7.x"
I always loved how things looked in previous versions of iOS. The detail in the icons... the craftsmanship... etc. This just seems lazy now. If they didn't make it so hard to go back that number would be lower. I would be using iOS6 for sure. And my 4S' battery life is so much better than it was on 7.0.6... That graph is bs. Great news. And remember only Apple can do this because they control both the hardware and software experience. Using 7.1 on multiple 5s' and not seeing odd battery drainage. Haven't really seen anything out of the ordinary since 6x. really you are gonna stay on 7.0.6 for a total of an extra 20 minutes of battery life that some chart tells you about? you are missing out on a very nice update.